What does the future hold when it comes to energy and economy? Continued growth for both, or inevitable decline? With a world economy and energy environment at a critical crossroads, what scenarios are most likely to unfold? And what can you and I do to create a sustainable future? These were the questions on the table during a free-ranging discussion amongst a diverse panel of energy, economic, and environmental experts. On September 29, 2009, they met at an Audubon-hosted event to share their answers. Check out their visionary scenarios and creative solutions via these videos, and listen to the lively Q&A that followed at the Kimberlin Nature Education Center at Audubon Greenwich in Connecticut. investment research firm Trucost and Co-Editor of the book Sustainable Investing, presents research on how carbon will impact investment portfolios when cap-and-trade systems come into play. explains how net energy (what¹s available for use after extraction) is declining toward an ³energy cliff² where we won¹t have sufficient energy to fuel our modern lifestyles. He cautions that if we don¹t pursue solutions to this problem, it will soon become a predicament with uncontrollable outcomes. hear the complete presentations from Moderator Bill Baue and Panelists Libby Cheney, Cary Krosinsky, and Chris Martenson in this podcast. The videos edited out over 5 minutes of each presentation, as well as the question Baue posed to each panelist after their presentation. So, to get the full scoop, listen here. 61 minutes. A fascinating question-and-answer session followed the presentations. Questions came from audience members representing the investment, consulting, academic, and NGO communities. 47 minutes. To learn more about energy demand, use, conservation and policy, we invite you to view the following resources, recommended by Audubon magazine, our forum panelists, and forum Sponsor, Shell. Audubon Magazine, May/June 2009 Issue. Instead of pumping billions of tons of carbon into the atmosphere, we might start putting them back where they came from: under-ground. Audubon Magazine, March/April 2009 Issue. A new approach called feed-in tariffs could offer the best, and quickest, solution to global warming. Learn how these tariffs work. Audubon Magazine, March/April 2009 Issue. 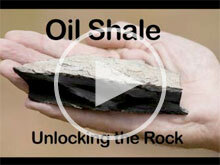 Oil shale is an energy developer’s dream: a plentiful rock that can be turned into billions of barrels of oil. But is it truly the Holy Grail, or fool’s gold? Audubon Magazine, January/February 2009 Issue. Change your lightbulbs? Or your car? If you want to fight global warming, it’s time to consider a different diet. Audubon Magazine, September/October 2009 Issue. The push to make cars more energy efficient and less polluting is driving the automobile industry in a whole new direction. The new energy future will need diverse energy sources to meet rising demand. Managing emissions and better energy use will help safeguard the environment and conserve resources. New energy sources and getting more from existing resources will secure energy for decades to come. An interactive site that invites you to take part in the conversation about securing, developing and managing energy for the future. Take part now! Jeroen van der Veer, former Chief Executive of Royal Dutch Shell plc, writes about a new world of energy. David is Shell’s Climate Change Advisor. Visit his blog to learn climate change, what it means, and what to do about it and how it affects our quest for more energy. Malcolm Brinded, Executive Director Exploration & Production, discusses what oil and gas companies can do to promote a gradual transformation of the global energy system at the European Association of Geoscientists and Engineers (EAGE), Amsterdam, June 8, 2009. Speech given by Peter Voser, Chief Executive Officer, Royal Dutch Shell plc, at the Spruce Meadows Economic Round Table in Calgary, Alberta, Canada. September 11, 2009. Speech given by Peter Voser, Chief Executive Officer, Royal Dutch Shell, at the Woodrow Wilson Center in Washington D.C. October 8, 2009. Sea Change is forum moderator Bill Baue’s nationally syndicated weekly radio show and podcast, covering the shift to social, environmental, and economic sustainability. Trucost regularly publishes research on important environmental issues that impact companies and fund managers. Details of, and free access to, this research are available here. Edited by Cary Krosinsky and Nick Robins. Written by international leaders in SRI, ethical and sustainable investment from Wall Street and the City, this accessible, fast-moving, information-packed book covers the full breadth and depth of sustainable investment. Chris Martenson believes the next twenty years are going to look very different from the last twenty years. This site is his attempt to explain why, and build understanding so that effective solutions can be created and promoted. The Crash Course is a video seminar on how our economy, energy systems, and environment interact, and how they will impact the future. Audubon Magazine is proud to host a free-ranging discussion among expert panelists. Information and ideas presented will be theirs and will not necessarily reflect Audubon policies or endorsement.